Following the success of our exhibitions Twist in my Sobriety at Kaufhaus Jandorf in October 2013 (2K visitors), Open House at Konzulát for Art Week 2014 (50+ artists and 1k visitors), and Turn Around Bright Eyes at Berghain in 2015 (900 visitors) with Koudlam live, vintage digital imagery , new tech… we now present A Partial Eclipse of the <3 on May 4, once again at techno temple Berghain, with live sound and digital visual art. 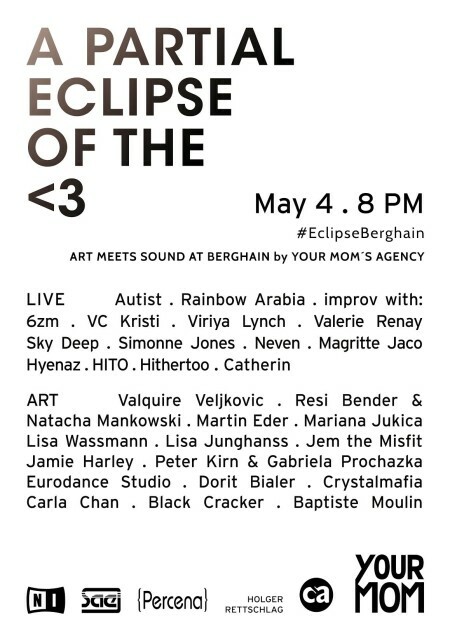 A Partial Eclipse of the <3 is organised by Your Mom’s Agency, supported by the participating artists, the SAE, Percena, Native Instruments, Concept Audio, Holger Rettschlag, and Berghain. The show is on one hand the follow up to Turn Around Bright Eyes, and on the other hand the Berlin pendant of From Berlin to LA, Second Edition festival from which we bring back Autist and Rainbow Arabia (Kompakt) both live. On May the 4th (be with you), join us and over 30 artists including Baptiste Moulin, Black Cracker, Carla Chan, Catherin, Dorit Bialer, Eurodance, Hithertoo, HITO, Hyenaz, Jamie Harley, Jem The Misfit & Arielle Esther, Kieran Behan (Crystalmafia), Lisa Wassmann, Magritte Jaco, Mariana Jukica, Martin Eder, Natacha Mankowski & Resi Bender, Neven, Peter Kirn & Gabriela Prochazka, Simonne Jones, Sky Deep, Valerie Renay, Valquire Veljkovic, VC Kristi, Viriya Lynch, and 6zm. 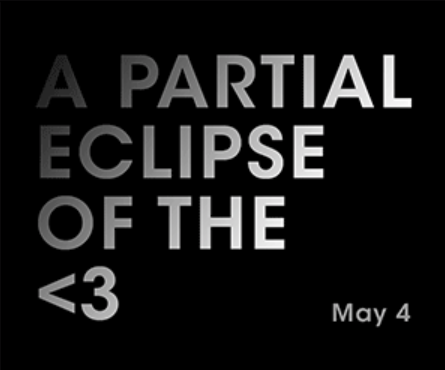 A Partial Eclipse of the <3 visuals were designed by I Want Everything.